Vacationing in Red River, NM? A family vacation destination for decades, Red River, New Mexico is an outdoor enthusiast's four-season paradise. It's location in Northern New Mexico's Southern Rocky Mountains makes for an ideal respite from the summer heat. Summer daytime temperatures average in the 70s, with cool evenings of star-filled skies. This mountain resort area offers recreation opportunities galore, including hiking, mountain biking, trail riding, fishing, backpacking and four-wheeling. Winter in Red River is ideal for snow conditions. The arid climate makes for beautiful, powdery snow, and the 8,750' elevation makes for lots of it. Whatever season you vacation in Red River, visit the folks at Bobcat Pass Wilderness Adventures for the ultimate in outdoor fun. Located at the top of Bobcat Pass in the beautiful Moreno Valley of Northern New Mexico, between Eagle Nest and Red River, Bobcat Pass Wilderness Adventures can outfit the whole family for fun-filled activities year 'round! Ride the countryside on sure-footed, gentle and responsive horses. Care is taken to match each rider's level of experience and age to the appropriate horse. 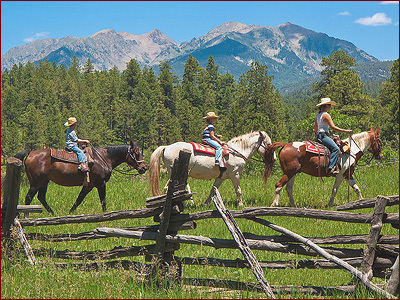 Trail rides through the stunning scenery and mountain vistas of the Carson National Forest make for a day of fun you'll never forget. You can ride for an hour or two, a half day, or enjoy a whole day in Northern New Mexico's breathtakingly beautiful Valle Vidal (Valley of Life). This lush mountain basin is one of the most treasured of New Mexico's land resources, for it's abundance of plants and wildlife. Your guide will be sure you see the wonders this magnificent area has to offer, from meadows full of wildflowers to stands of aspens with leaves quaking in the breeze. This is prime wildlife country, where you will spot numerous bird species, and possibly catch a glimpse of deer, bighorn sheep, or elk, so bring your camera and your sense of adventure. Full day rides require a 4 horse minimum, and lunch is provided. Five and seven day pack trips are available in September when the fishing and scenery in the high country are at their best. This is a great vacation treat for families, and a first class adventure - contact Bobcat Pass for reservations and rates. Check the Bobcat Pass website for early June dates on rides, seminars and Cowboy Clinics from basics to packing and roping. You'll get Individual attention, and a great time is had by all! 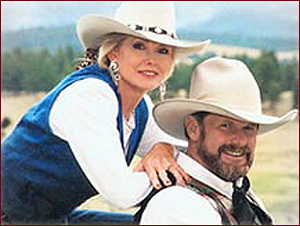 A Fitting Finish to Your Trail Ride is a Cowboy Evening! Some just can't get enough of the ways of the Old West. So come on out and enjoy a wonderful evening of food and entertainment under Red River's starry skies, Cowboy Style at a Bobcat Pass Cowboy Evening. 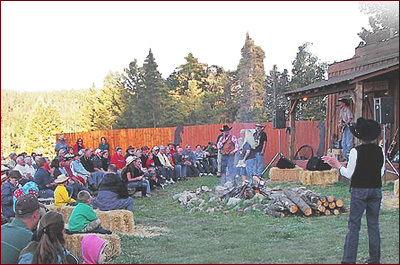 In season, every Tuesday, Thursday, and Saturday Evening, you can settle down to an evening of true western hospitality, with dutch oven cooking and live entertainment at its best! Enjoy one of the best Ribeye steaks west of the Mississippi, or a juicy grilled chicken breast, accompanied by cowboy beans, baked potato and corn on the cob, with hot ranch biscuits and mouth-watering cinnamon rolls. Enjoy iced tea, lemonade and cowboy coffee along with live music. Everyone loves a Cowboy Evening, and this one's a real hit with adults and kids alike, so advanced reservations are recommended. And now you can take your Cowboy Evening home with you! Pick up some bottles of Lewis family BBQ Sauce, Meat Marinade and Raspberry Vinaigrette in the Bobcat Pass Gift Shop or through the online store. Want more authentic Cowboy fare? Add a copy of Sue's cookbook, Biscuits to Brulée II. Prefer a More Modern Mode of Transportation? You can still see all the beauty and majesty the Sangre de Cristo range of the Southern Rockies has to offer, on an ATV. Come ride the Old Red River Pass area in beautiful Kit Carson National Forest. Bobcat Pass Wilderness Adventures offers a 2 hour guided tour. One day advance reservations are highly recommended, and don't forget to bring your camera! Let the folks at Bobcat Pass help you enjoy the time of your life with great rides to compliment your evening of real western hospitality! Bobcat Pass Wilderness Adventures offers ATV trips leaving at 3 pm for a 2 hour tour on Cowboy Evenings or a Horseback Ride leaving at 4 pm for an hour tour getting you back in time for dinner. A 10% discount is extended to those with dinner reservations. Come ride with the best! Bobcat Pass offers a choice of tours in several scenic areas for a great and beautiful ride. Bobcat pass provides the suits, boots and helmetsjust bring your camera, gloves, and goggles...and be prepared for the adventure of a lifetime! For the more serious and adventuresome rides check out the Hopewell trips. One day advance reservations are highly recommended. Inquire about Bobcat Pass Wilderness Adventures guided Elk Hunts for the hunt of a lifetime. Please inquire early, as most hunts are draw which means all information is needed by early April. If you are planning a vacation in Red River, be sure to include Bobcat Pass Wilderness Adventures in your plans, Henry and Sue will see to it you have the vacation of a lifetime! And for luxurious and private accommodations, book your stay at the Bobcat Pass Vacation rental home. This fully equipped, 4 BR, 3+ bath home has stunning views of the Moreno Valley, and a great wrap around porch to enjoy the scenery and wildlife. It's the perfect location for a large family or group. See details on the website.